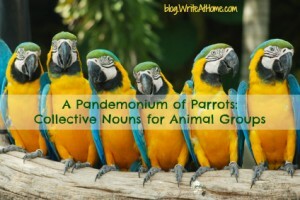 I recently posted an article on subject-verb agreement when the subject is a collective noun, and in researching collective nouns, I came across several sites that list the numerous and colorful names for groups of particular animals. We all know dogs come in packs, cattle come in herds, and fish travel in schools. But did you know that a group of otters is called a romp or that a bunch of peacocks is an ostentation? Below is a fairly comprehensive list garnered from various locations on the web. I don’t know how authoritative it is, as no two sites had quite the same list. Who’s in charge of such matters anyway? I found myself fascinated for hours (literally) by this list. So many of these names are beautiful, clever, or evocative. Take, for example, a bloat of hippos, a bouquet of pheasants, or a murmuration of starlings. I love the alliteration of a flamboyance of flamingos, a rhumba of rattlesnakes, or a scurry of squirrels. Or the humor of a prickle of porcupines, a memory of elephants, or a lounge of lizards (really?) I can’t pick a favorite — an ambush of tigers? A murder of crows? A pounce of cats? There is poetry here. Please don’t resist the urge to talk about your favorites in the comments below! And, of course, feel free to share this. An Exaltation of Larks is my favorite and a great book too! I believe a “Congress” of Baboons is also acceptable. Digital printing now accounts for around 60% in the volume, and also over time, says Payne, digital output potentially could displace much on the plant’s offset litho production. ImageMark’s conventional pressroom houses a practiced six-color press plus an selection of related equipment acquired inside buyout of an company in nearby Charlotte, NC, this past year. What do you call a group of trees? A cluster? A stand? My fave is GRUMBLE of pugs! I see you have a ‘nest’ of mice, what would be the grouping designation of rats? 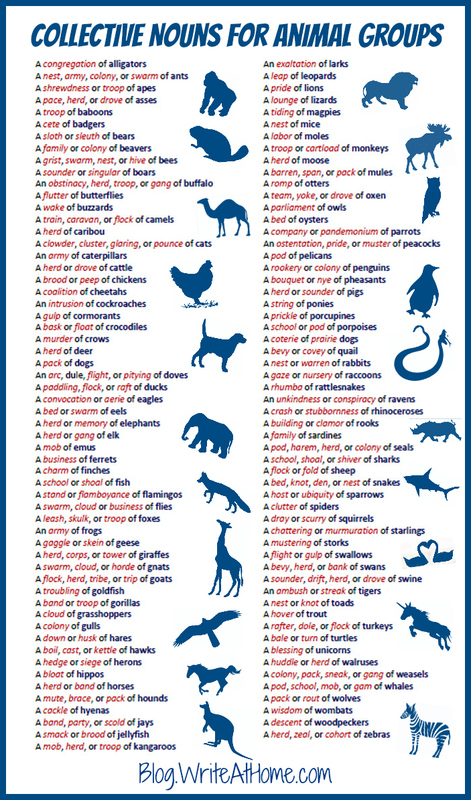 So, the question is, how MANY of the animal does it take to qualify for the use of the collective noun? How many parrots in a pandemonium of them? Two or more, I assume, but I don’t know for sure. Good question. As you’ll see, one of the commenters (CQ by name) referred readers of that blog to yours, Brian. Your commenters are quite as clever as the people who invented the names in your comprehensive list! May I suggest: pandemonium of pandas , caravan of camels, armada of alligators, phalanx of armadillos or rhinoceros, mess of pigs, flotilla of pelicans, reunion of raccoons & brace of bears. I strongly suspect , bored poets. thanks for sharing such wonderful lnfo , would be happy if you pls tell the origin of such collective noun , i mean why do we call the group of otters as a romp or that a bunch of peacocks as an ostentation or Pandemonium of Parrots ? I wish I knew, Abhra. I wonder myself who invented the terms and how they came to be recognized. What about ‘a gaggle of girls’? I have been fascinated by these since childhood, as you say they evoke much more than the commonplace. As a teacher I introduce the more common of these each year, although they are not part of the national curriculum, because they are so delightful and in danger of not being known. We usually have fun with collective nouns for different professions. My favourite so far has been, ‘ an amen of vicars’! You left out Coven of Ravens. I think a “gulp of swallows” has to be the funniest one! When you said fairly comprehensive, I think that was the understatement of the year 🙂 .